In this beer blog, we are going to get into a new brewery, which is called Furthermore Brewery, and the beer is called Proper. 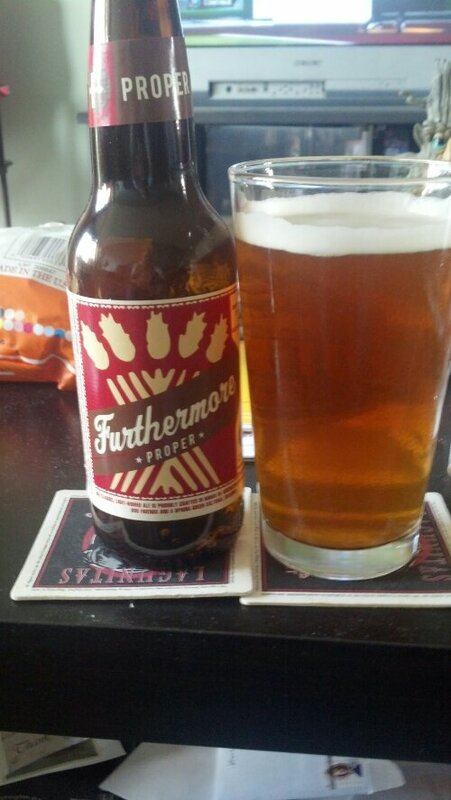 There is no history on Furthermore Brewery. There is nothing on their website. The only thing I know this brewery is from Spring Green, Wisconsin. Let us get into the brew. It has a slightly cloudy golden color with small constant bubbles. It has a constant white head on the beer. There is really no smell to this English style ale. The taste of this medium body is a carbonation malty to almost hazelnut to it. The aftertaste is dry with a slightly hazelnut to it. It is drinkable. Our classic, Light-bodied ale is proudly crafted in honor of American Players Theatre, our friends and a Spring Green cultural treasure. It’s not just about the best beer, but the best places to enjoy it. APT and its festive, open-air venue have inspired us to craft an elegant, light-bodied and “proper” English Ale. At 12° Plato, the Proper is fairly light, with subtle toasty notes and a slight sweetness garnered from a touch of Munich and Caramel Malts. 15.5 IBUs (bitterness units) is enough to sharpen the mouthfeel without coming across as bitter. The hop bill is at its core, English—Kent Golding being the dominant player but we’ve employed “Brewer’s License” and thrown in some very non-English Tettnang hops—because it tastes good. Furthermore Proper is a toast to APT, a Spring Green gem.